Are Pesticides Lurking in Your Favorite Cup of Tea? Tea can be amazingly beneficial for your health -and I love it! In fact, I’m such a tea lover that my friends sometimes impersonate me by holding a glass of iced tea and sipping on the beverage through a straw. It’s a classic, spot-on parody of someone who should probably drink more pure water than so much of her favorite beverage. Nonetheless, in a recent investigation after hearing about how many pesticides are used in farming, I had to assume they were being used in tea fields as well. I’ve since switched to all organic teas, shunning some of my favorite brands due to high levels of carcinogenic chemicals found in their products. Celestial Seasoning Teas have dangerously high pesticide residues in their tea bags. High pesticide levels were found in over 91% of samples tested, and it didn’t matter which flavor. These nasty chemicals were found in Antioxidant Max Blood Orange to Sleepytime Kids Goodnight Grape, and others. While a spokesperson from the company ensures the public that they utilize ‘a rigorous testing protocol,’ it might be time to find a new lab, and stop sourcing tea from farmers who rely heavily on pesticides. This brand also contains GMOs. 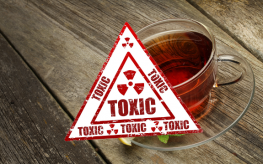 Lipton, Tetly, Twinings and other popular tea brands were full of pesticides, too. They contained bifenthrin, imidacloprid, acetamiprid, chlorfenapyr, pyridaben, acephate, dicofol and monocrotophos pesticides. And while the Health Canada Review who originally conducted this testing on different teas says you would have to drink a whole lot of it to be affected, we now know that pesticide and herbicide combinations are truly deadly. Canada’s Food Inspection Authority (CFIA) tested in 2009 and again in 2011, and still found high levels of pesticide residues in numerous tea brands. Bigelow, Tea Forte, and Mighty Leaf all contain deceptive “natural flavors” labeling, and also contained both pesticides and GMOs. The Republic of Tea, Teavana, Tazo, and even Yogi Tea contained pesticide residues. What would the gurus say?! Furthermore, the tea you’re drinking may contain concerning levels of fluoride. One study which analyzed inexpensive tea bags from supermarkets including Asda, Sainsbury’s and Tesco, found that drinking the tea could push a person’s fluoride intake over the ‘daily recommended level’ and put them at a higher risk of bone and dental disease. The teas provided anywhere from 75-120% of the recommended daily intake. Lastly, many tea companies do not source their products from responsible growers. As Davidson’s Organics, a non-pesticide using tea grower says, “the pressures have mounted as we introduced industrialized agricultural practices, added chemical fertilizers or engaged GMO practices to make the land yield more and used pesticides in the name of protection.” The results of these practices have been frightening – environmental pollution, soil erosion, and loss of biological diversity. Since the tea I drink can either minimize or contribute to this problem, I’m only drinking 100% organic, non-GMO tea from now on. You can source Non-GMO Project Verified teas, and organic by reading labels, or buying in bulk. Numi tea is one safe brand to purchase. Why is there no mention about Red Rose orange Pekoe tea? I just went to the non GMO’s website and Republic of tea, yogi, twinings, and Tazo are all on their list of safe teas to drink. So you may want to do an update on this article. I contacted Republic of Tea and they assure me that pesticides are not used on their teas. See below…scroll to bottom and see messages going up. So, are you saying pesticides are not used on the teas or are you saying the pesticides are washed off? I need that clarification. Thank you for your email. The Republic of Tea sources only the highest-quality tea grown in the premier tea gardens in the world. From the Wuyi Mountains of China to the island of Sri Lanka, we treasure our long term relationships with each supplier. All of our teas are naturally produced. All of our teas are inspected and undergo the most stringent of quality assurance processes at the garden level before they are shipped. Once they arrive at our packaging facility, they are inspected again. We take this process very seriously to ensure that we’re providing our Citizens with the highest quality and safest teas from each unique origin. Also, The Republic of Tea is so proud of our partnership and certification with Non-GMO Project! This is why we switched to Traditional Medicinals Tea. Fair Trade & organic. Their children’s Nighty – Night Tea is the best! The adults and kids drink it; it has a natural sweet & fruity flavor that needs nothing extra. This is why I drink brands of tea such as Organic India, Alvita, and Traditional Medicals. you are going to test coffee brands…or have done?? Excellent article. Thanks so much for your investigative work! I’m very surprised to see some of the tea brands on your list, but am so grateful that now I know to chose from other organic, non-GMO brands.